First off, I would like to welcome new reader Kaptain Kolbold. I hope you enjoy the blog. In case you don't read my other blogs, I went to Cold Wars 2012 and so I am (slowly) writing up the games and sights. My reports that were of a more general wargaming nature appeared on my Dale's Wargames blog (first, second, and fifth reports), while the DBA and HOTT oriented ones appeared on my Dale's DBA blog (third and fourth reports). 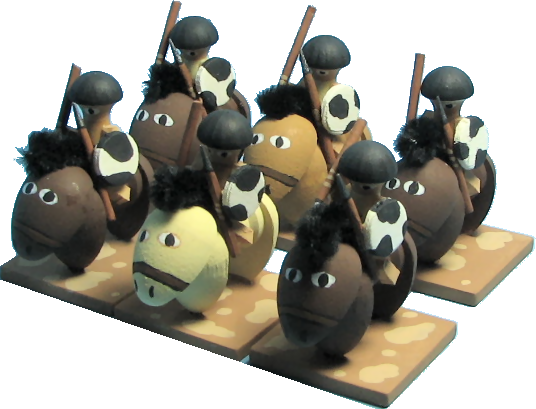 This blog has the two games recreating the battle of Zama, using Matt Kirkhart and John Acar's "craftees" – wooden soldiers made from wood craft parts like thread spools, plugs, split eggs, and such. Believe it or not, this was the game that I travelled across the country for. 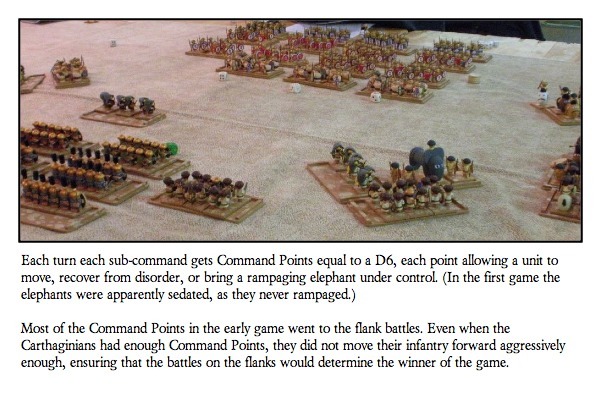 I wanted to see these wooden soldiers for myself, plus play a mass ancients game using Matt's rules, Arrayed for Battle! It was well worth the trip. First off, a little about the rules. They can be found for free on the Wargaming on a Budget forum on Yahoo in the Files section. 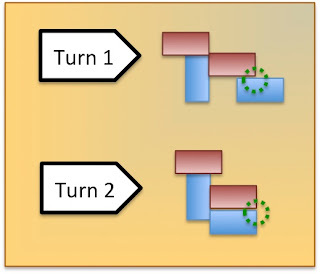 They are based on Joe Morschauser's rules with a command and control element similar to DBA. Units have morale, fighting, armor, and movement attributes. Morale and fighting is expressed as a value to be rolled on a D6 or less. 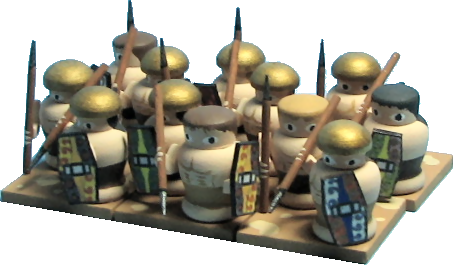 In the first game I played the Romans, specifically the right flank command consisting of the Numidian cavalry and warriors and one "column" of Romans. Unfortunately, my camera had died before the second game, so there are no pictures. The basic battle went roughly the same. This time, however, I was on the Carthaginian side, on the opposite flank (with the Carthaginian cavalry facing the Roman cavalry). The biggest change was that the elephant's Rampage rule was put into effect. Initially it sounded like the Rampage rule would be a benefit – of a sort – to the Carthaginian player. That was not so. Basically this rule reflects that the beasts are unmanageable and they automatically rampage at the end of each melee round. The net effect was that once elephants got into melee, they would continue to drain you of Command Points in order to keep them effective. I will be honest; I don't really know how effective elephants were in combat in the ancient world. Against untrained, superstitious barbarians they probably were. Against the Romans they apparently became less effective as time wore on. By Zama, they appear to have been useless, if the Zama articles in Slingshot and many rules are any indication. (In DBA they are pretty effective in combat, but they are just harder to get them into it, or to maneuver in general.) 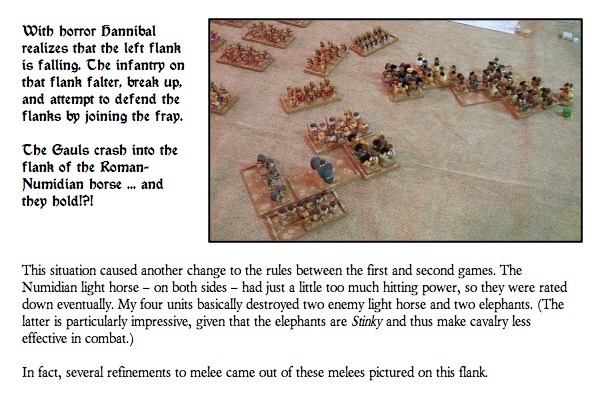 In hindsight, if we had really wanted to win, we should have pulled our elephants back into reserve and used them at the end of the battle, when things are less ordered. They would have been destructive hitting the flank of a heavy infantry unit. 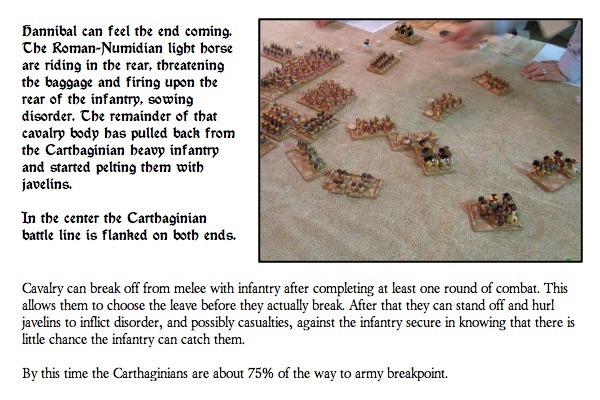 In the second game, having experience in why the Carthaginians failed in the first game, I encouraged all of the infantry commanders to press forward hard. One difference that came in to play this round was that the Celts lost their 9" charge. This was a bad change, in my opinion, as it allowed the advancing Romans to game their approach and stay just out of 6" range, making the Celts lose their charge bonus. 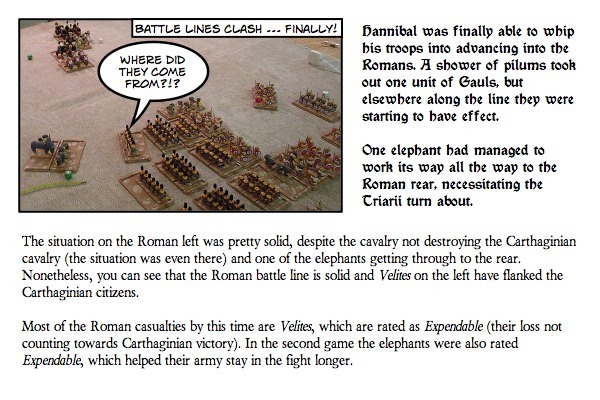 I think this was a factor as to why the Carthaginian infantry battle could not make any real headway and all of the Celts died quickly in the second game. I, of course, cheated a little and rather than keep the rigid "column" formation had peeled off the elephants and the third line Veterans to support my cavalry attack on the flank. It worked, to some extent, but while my missile dice were hot as the Romans, my melee dice were not as the Carthaginians. The cavalry melee came down to two units on two units, equally matched. One of my units broke first, but his first broke quickly afterwards. The cavalry continued to grind until both sides had simply to kill one base of the other side, and then it to fail its morale check, and it would be all over. After some tense die rolling, it was the Romans that cracked, and the Carthaginians victorious! One change that had made a difference in the second game was to rate the elephants as Expendable. This allowed the Carthaginians to lose those five units and not have them count against the army morale. 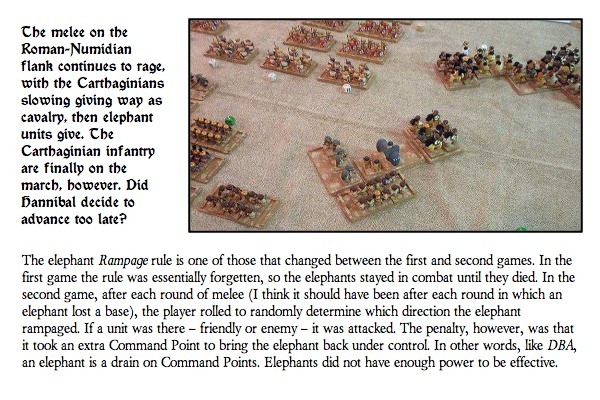 This was a good rule change but it was count-balanced by making the elephants Command Point drains. (I actually cheered when my damn elephant died!) Seems like the rules need to be tweaked more there. 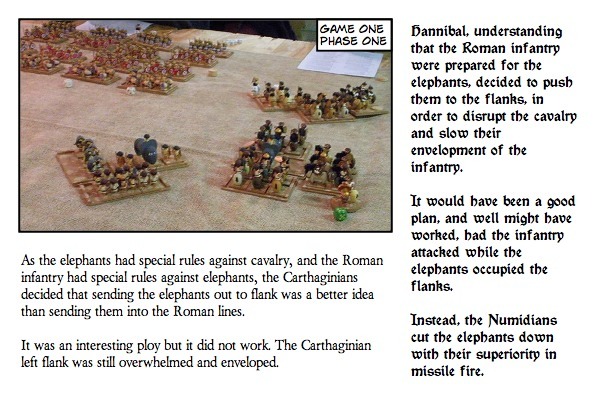 The Carthaginians again lost the left flank, which like the elephant losses, was inevitable. The Roman-Numidian player did much as I did and wrapped the flank firing at the infantry, and using one to harras us in the rear. 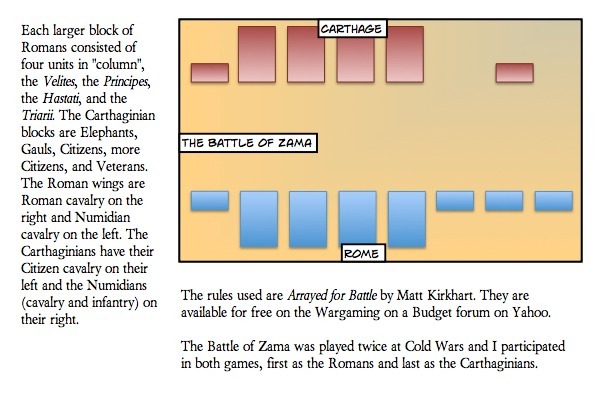 With time running out, Carthaginians units falling faster than Romans the game was called at about 11 PM in favor of the Romans. 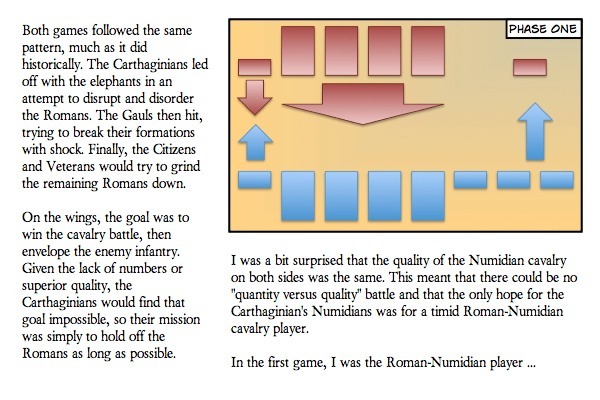 The Carthaginians had not won – not by a long shot – but it had made a better showing than in the first game. 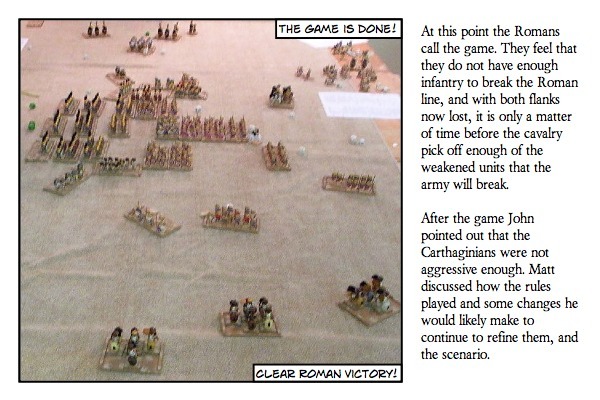 Given that the rules changes might have been net negative to the Carthaginians, I think that was a good result for us. Can't have Hannibal winning, now can we? 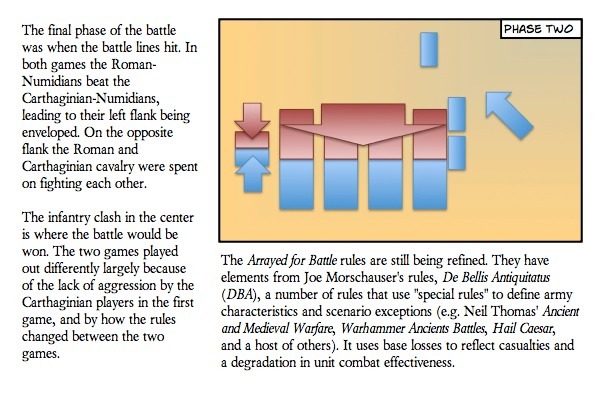 I like the rules Arrayed for Battle, and would gladly play them again. I would like to run my own game of them to see where the hole might be, but they played well and allowed the Player-General to focus on tactics and not on the fiddly bits of unit maintenance. The key to games these rules are the special rules themselves. Get them right and the scenario goes well. I think that, for the most part, the special rules were right. As for the core rules I think the only part lacking is the inability of a unit to turn to flank or rear after combat has started. I think that if a unit is unengaged to the front, and after it has fought one round of combat against the unit to flank or rear, the unit can elect to take a Disorder marker and face the opponent. Another area that caused some heartburn is the contact rule. This was cleaned up for the second game, but I can see some problems coming up in complex melees. Basically the rule, as I understood it, was to center each unit's front edge on the edge that it struck, after the initial round of combat. 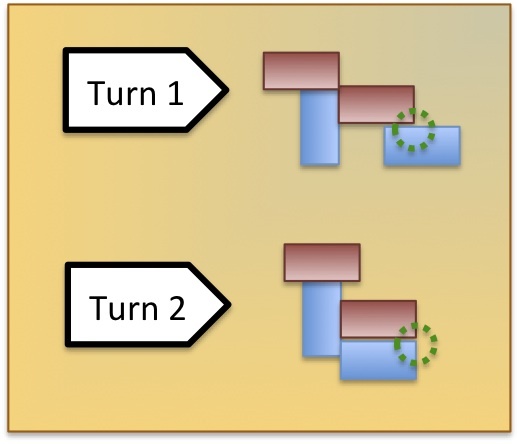 The figure below shows an example. The blue unit in contact with the front of the anchored red unit shifts to the left so its front is centered on the front of the enemy. The blue unit in contact with the flank of the anchored red unit shifts up so its front is centered on the flank of the enemy. The unanchored red unit shifts back and to the right in order to center its front on the blue unit's flank. This brings to mind a few questions though. How do you pick the anchor unit (the unit that will not move? What happens when a unit is shifted out of multiple contacts into a single contact? Like every good rules, special cases will have to be worked out but just with my own thought exercises I think the shifting of units should occur at the end of the first melee round rather than the beginning of the second melee round. This solves a number of problems about who can and cannot shift, and who should shift in the case of conflict shifts. As this is the Wooden Warriors blog and not Dale's Wargames it only seems appropriate that I review the figures. 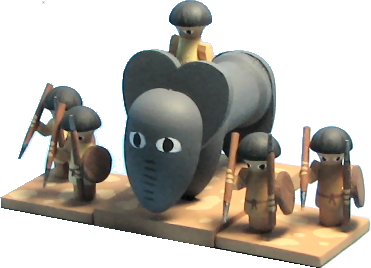 John's Carthaginians included five elephant units, each consisting of an elephant figure and two stands of supporting light infantry. The infantry are micro shaker pegs and tile spacers for the arms. The elephant consists of three split robin's eggs, a heart, and a spool. John seemed to think that the spool he used was too long, not giving the elephant enough of a belly. I think it looked great. The eyes were great as some were scowling. The Celts were a very beefy figure, as shown below. They were distinctly larger figures and easily identifiable on the field (which is a good thing). These figures were simple constructions in that the majority of the figure is a candle cup (upside down). Either a round head plug or a button plug served as the figure's head, while tile spacers made up the arms. Shields were decorated with custom inkjet printed shield designs. Very effective! 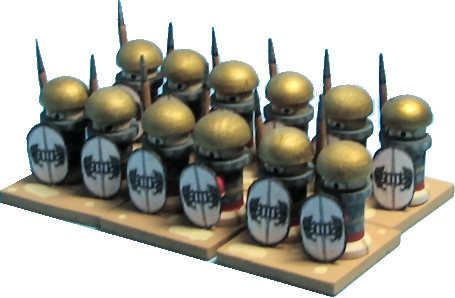 The Carthaginian citizen units also received the printer treatment for their shields, with each unit having a different (uniform) device (primarily to sort which stands belonged to which units, if I understood correctly). Clothing was not uniform, however, which made for a nice effect. Again, the figures are micro shaker pegs and tile spacers for the arms. Very simple construction that looks great on the table. The Veteran infantry is constructed a little differently, largely to show that they wear more army and to make them distinctive on the table. Their body is a spool with a button plug serving as the head and helmet. Again, tile spacer arms and printed shields make these units look great on the table. 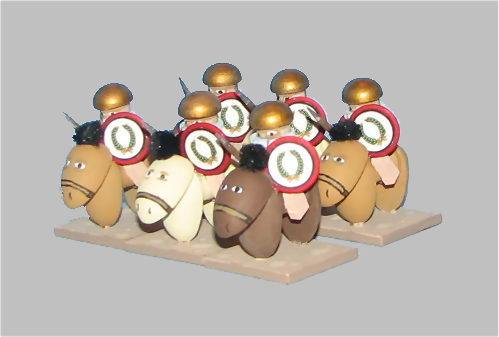 The Carthaginian horse was constructed very similarly to the Veterans. They are spool and button plug with the horses being three split wren's eggs and a spool. Tile spacers serve as the arms and legs of the figures. Note that because the bottom of the thread spool was not cut off (and I don't blame John as cutting round spools is a bear of a task), it makes the cavalry a hit taller than normal. But, then again, what is "normal" with a craftee?!? 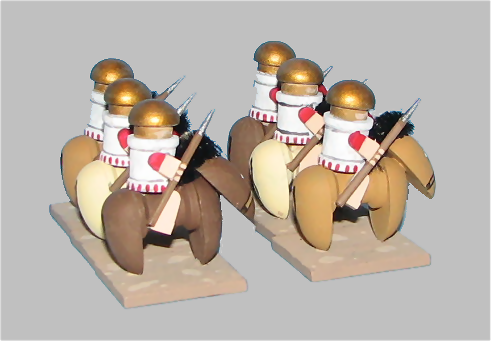 The Numidian light horse are micro shaker pegs on horses of three split wren's eggs and a spool. Very effective paint jobs. Also, now that I have seen the pipe cleaner manes I think they are very effective. If I were to get more into the 25mm scale (as these are), and I could find the appropriate chenille pipe cleaners, I would use them too. This is what the Carthaginian army looks like arrayed for battle. 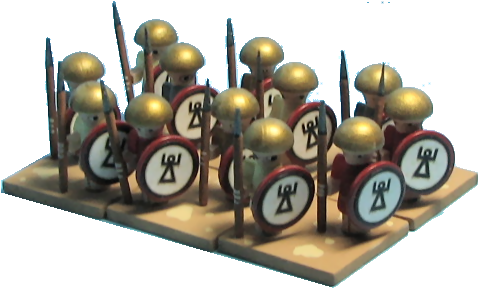 Matt's pictures for the Roman army can be found on the Wargaming on a Budget forum on Yahoo. I cannot link to the photos there as they will only be visible if you are a member. And if you are a member, well you can just view them over there!